Bathrooms sell houses, which brings them to the top of the priority list when preparing a home to sell. The master bathroom is often the very last room decorated in a home because it is the room least visited by guests; however, it will be one of the first rooms addressed when staging a home. Buyers will most appreciate a bathroom that reminds them of a luxury hotel. 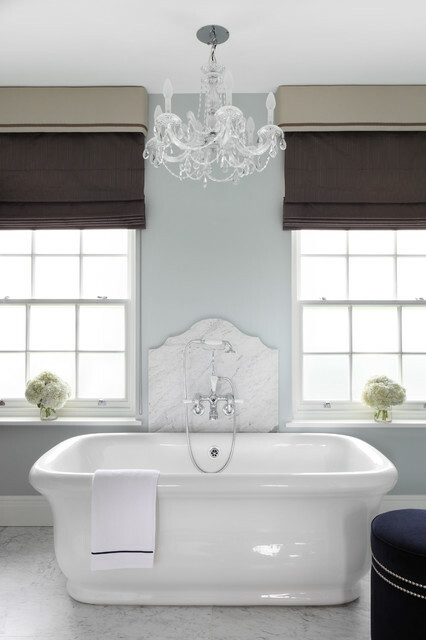 Clean, bright, fresh and upscale are the feelings to aim for when staging the bathroom. Living in a staged home while it is one the market can be very challenging, especially when rushing out the door. Taking note of these three tips will ensure your staging efforts will hold their value from MLS photos thru closing. Don’t miss the opportunity to make vignettes both functional and beautiful. 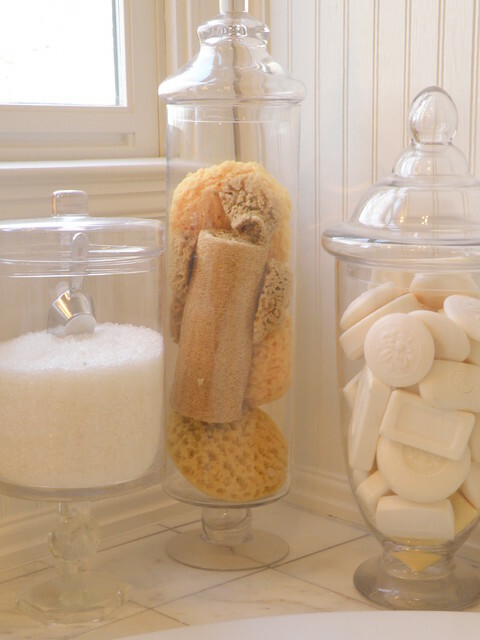 Apothecary jars used as beautiful vessels for everyday essentials in the bathroom is the perfect example of a functional vignette. New fluffy towels are also the perfect addition to a staged bathroom. A small investment in a few high-quality towels to display in your bathrooms makes a very big impact on the spa feeling you want buyers to feel when entering your space. Purchase a few hand towels to place next to the sink(s), and don’t forget to layer a few on the towel bar or bathtub as well. Pure white is best for the luxurious hotel feel, but towels are also a nice way to include the pop of color also used in adjoining rooms, maintaining a cohesive look throughout the home. Doubling up on your shower curtain creates a luxurious, more expensive, look. This twenty-dollar (or so) addition will increase the value of the overall feel without breaking the budget. This tip is a great solution for homes featuring a shower/tub combo or no separate master suite. Although it’s no secret you brush your teeth, buyer’s shouldn’t be reminded of that. The goal of staging a home properly is to allow the buyers to vision themselves living here. Any sights (and smells) of you should be removed. Be certain to put away all grooming tools before rushing off to work, including blowdryers, toothbrushes, combs, etc. The counters should be cleared and wiped down each time you leave the bathroom to ensure the bathroom is ready for a showing at any time. Medications should be removed for safety and mystery. Buyers should not know about your war against a wart or insomnia. Removing waste baskets, scales, cleaning supplies and hampers is also essential in maintaining the mystery buyers deserve while touring your bathroom. If waste baskets and hampers must stay, ensure they have a lid, so potential buyer’s are at the very least blinded from what’s inside. Often overlooked, children’s bath toys should be hidden as well. The foam alphabet and plastic boat will not add value to your home. Think about walking into your hotel room after check-in, only to find a clump of hair or toothpaste in the sink. Eww, right? Your impression of high-value luxury just flew out the window (or sliding door to your oceanfront balcony). In order to get buyers to see the highest value in your home, your bathrooms must sparkle and shine. When occupying a staged home, all family members must adopt clean freak ways until closing. Fortunately, this inconvenience will only last a few short weeks because you wisely invested in home staging services!